Cultured Care sent me a pack of their probiotic gum. As most of you know, the big trend now is probiotics so I was excited to be able to review this product. According to this site, this is what probiotics are for: The word pro-biotic literally means “for life.” Probiotics are friendly, health-promoting bacteria that live virtually everywhere. They live in our soil, air, water and food. They even live in and on us, “colonizing” in various parts of the body including the mouth and intestinal tract. Restoring and keeping a healthy balance of friendly probiotic bacteria supports our natural immunity and resistance to disease-causing (pathogenic) bacteria. Probiotic supplements like lactobacillus acidophilus and bifidus have been growing in popularity for promoting gut and digestive health. My opinion: The gum tasted great and was my favorite gum flavor- spearmint. I love the health benefits of this product and would definitely recommend it! Giveaway: Three readers will win a sleeve of Cultured Care Probiotic Gum. The contest is open until midnight Sunday August 8! The winner will be chosen Monday August 9 using Random.org. Mandatory: Visit Cultured Care and tell me one thing that you learned about probiotics. It stimulates the throat’s natural immune defense system and protects the mouth, ears, nose and throat against infection. I learned that this is the gum is sweetened with xylitol and stevia leaf extract...love that!! I liked Culture Care on FB!! When I visited Cultured Care, I learned that there is more than one type of probiotics; I thought there were just gut probiotics, but what Cultured Care contains are called oral probiotics, which means they're good bacteria for your mouth! I found your site via your linky post on One2Try. I also subscribed via email! Thanks for hosting this giveaway! I learned that there is no heat or moisture involved in making the gum. like coultured care on fb. I learned that you can chew up to 3 pieces a day. I learned that there is more then one type of probiotic. I found you through Menopausal New Mom. I learned that BLIS K12 was discovered by Professor John Tagg. I saw your giveaway on Tight Wad in Utah. 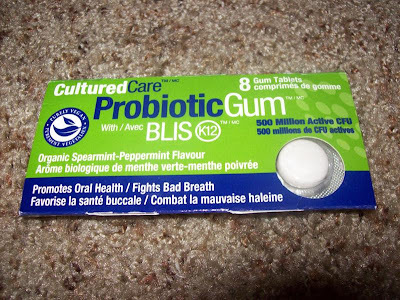 I learned that "oral probiotics prevent the overgrowth of unfriendly bacteria and act as our first line of defense against infections that enter through the mouth." I found your site from a comment & url you left on the "One Cheap Canadian Mom" blog. I learned that CulturedCare Probiotic Gum with BLIS K12 improves oral health including the health of teeth and gums. It protects the body's immune system: ears, nose, and mouth against infection. Awesome! I found your blog on Fun Friday Links! I learned that probiotic Gum is Sugarless and is healthy for Teeth and that is helps you to prevent from infections =) I like it already. Like cultured care on FB!